I am picky about deviled eggs, and a bit of a purist (you’ll discover why only a “bit” later). 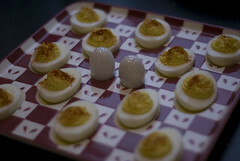 To me a devilled egg consists of the simplicity of hard-boiled egg, mayonnaise, mustard and a light dusting of paprika. Don’t muck it up with pickle relish or other contaminant. But rather than keep my secret, I included this in the “Making” section, because I am going to share my recipe for Deviled Eggs. As with any good recipe it’s more than just ingredients, it is technique as well. Stealing from Alton Brown’s playbook, I will break things down into Hardware, Software and then describe the technique. Egg Cooker. Yes, I know you can boil water and do it yourself, and it is the dreaded “uni-tasker” but I will not part with this gadget. In fact, the whole recipe flows from the capacity of my 1960’s era Sunbeam Egg Cooker. 8 Eggs. Food Processor. Nothing does more to yield a smooth filling than the Food Processor. Yeah, it’s a pain to lug out and clean, but so worth it. Large Mixing Bowl. I have a Pyrex bowl I use. No mixing will happen here though. Sharp Knife. I like my Henckel’s 4″ paring knife. Pastry Bag. Using a pastry bag is actually easier than spooning it in once you get the hang of it, and makes for a better looking egg. I use a #21 closed star tip. And yes, I really AM that compulsive about it. Follow the directions that come with the egg cooker for hard-boiled eggs. You also want to boil the Eggs the night before. It is so much easier to peel a cold hard-boiled egg. Also, if you experience breakage during cooking, you have time to cook up another batch. Use the needle in the cooker to pierce the egg. I pierce the fat end and put the egg point down in the cooker. I did not always pierce the egg, but this allows steam to escape and prevents breakage. Always put the pierced end up. Let the eggs warm up before starting the cooker. I usually load them in and let them sit for a while (30-60 minutes) before starting the cooker. I have never had an egg break when I have allowed them to warm up first and pierced the top of the egg. Remove eggs promptly from cooker and put in an ice bath. This is what the large mixing bowl is for. This is a trick I think I learned from a Good Eats episode. It prevents the yolk from forming the green barrier. Also stops the carry-over cooking. Drain, dry, and store in the refrigerator over night. Peel the day you are making them. When peeling I lightly tap the egg on a firm surface while rotating the egg. Then I carefully peel of the shell under running water. Slice each egg in half, lengthwise. Place yolk in work bowl of your food processor. Place whites on an appropriate platter. I have a great Tupperware container that they no longer make. Add the Miracle Whip, mustard, salt and pepper. Process until smooth. May need to scrap down the bowl. Assemble the pastry bag and fill with the yolk mixture. It’s snug, but it should fit into a 9 inch Wilton decorating bag. Miracle Whip?!? Are you for real? I have tried this recipe with mayonnaise, and you know, Miracle Whip really DOES add zip. If you look at the ingredients, there are spices and vinegar in the Miracle Whip. So I guess I could use real mayonnaise (even make my own) and then work on how much vinegar and what spices to add… or… I could just use Miracle Whip. See.. it’s “psuedo-foodie”. Or in this case “practical foodie”. Would you like a little egg with your mustard? Yeah, I like me some mustard. The key to this recipe, imho, is the ratio: 2 parts Miracle Whip to 1 part mustard. In our family (and the Shermans like themselves some deviled eggs) mine are the most “mustardy”. I never thought I’d see the day… the secret recipe revealed. These are indeed THE BEST deviled eggs on the planet. I just may be too lazy to make them myself, though! Oh my god! This is the WORST thing to eat in the summer, unless you love food poisoning and being on the toilet for two days! happened to me.. be very very careful with eating or serving ANYTHING in the summer heat that has mayonnaise or custard in it! Ugh… I had a woman at work leave deviled eggs out for HOURS unrefrigerated! while she preached to the staff… I got so ill I was about ready to die. Happened at another telemarketing job too, where being on the phone was more impt. to them than our health safety.. another idiot supervisor set the food out too early, though I told her it was too early and guess who got sick?? I would have said proper refrigeration goes without saying, but obviously that is not the case. Previous post: What is pFoody.com?